The U.S. caps and closures market is fairly consolidated, with the top five companies expected to exhibit clear dominance in the coming years. The leading companies, namely Silgan Plastic Closure Solutions, Closure Systems International, Inc., AptarGroup, Inc., and Bericap GmbH, and Co KG., have relied on aggressive expansion as the go-to strategy for thriving in the U.S. caps and closures market. Well-funded research facilities and manufacturing facilities across the U.S. have been the key assets for companies eyeing long-term dominance in the U.S. caps and closures market. The aforementioned five companies accounted for 55% of the U.S. caps and closures market in 2015 and are likely to exhibit similar levels of dominance in the market in the coming years. Smaller players in the U.S. caps and closures market find it easier to adapt to technological changes due to their smaller scale of operation, but establishing a dominant share in the market seems to be beyond the capacity of most emerging players at present. 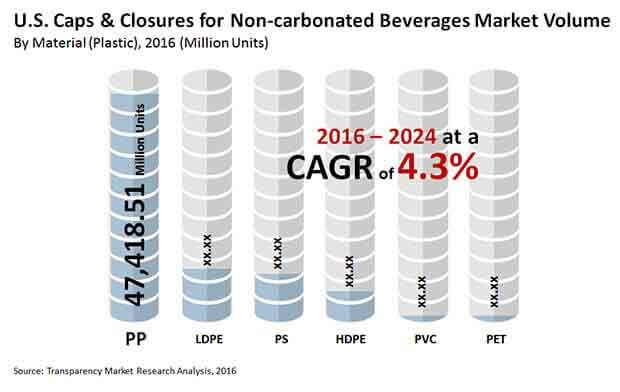 According to Transparency Market Research (TMR), the U.S. caps and closures market for non-carbonated beverages is likely to become more intensely competitive in the coming years. The market is expected to exhibit a steady 4.3% CAGR from 2016 to 2024, with the market’s revenue expected to rise accordingly from US$2.6 bn in 2016 to US$3.8 bn by 2024. Rising Demand for Single-serve Beverages to Drive Use of Caps and Closures in U.S.
One of the prime drivers for the U.S. caps and closures market is the increasing demand for single-serve beverage packs. Single-serve beverages have become widely popular in the U.S. thanks to their greater convenience and are likely to play a significant role in the U.S. market for beverages in the coming years. This will ensure steady demand for caps and closures from the single-serve beverages industry as well as a steady influx of funding for research. The U.S. is witnessing a steady increase in the demand for convenience food and beverages. Single-serve beverages also play an important role in this, ensuring steady growth of the U.S. caps and closures market in the coming years. Seasonal fluctuations in consumer choice regarding beverages are also a key driver for the U.S. caps and closures market, as they force manufacturers to produce different designs of caps and closures. The rising demand for bottled water and various kinds of energy drinks is another prime driver for the U.S. caps and closures market. One of the main restraints on the U.S. caps and closures market is the high costs of upgrading the technology used to produce caps and closures and installing new manufacturing frameworks. Switching from conventional two-piece closures to newer one-piece closures is one of the key changes undertaken by the U.S. caps and closures industry. Conventional caps and closures are made from polyethylene, while the new one-piece closures are made from high-density polyethylene (HDPE), which confers certain structural benefits.